Description A snowboard game for girls. Move Betty, the snow boarding girls on her way down the hill and collect flowers and stars, jump ramps and avoid the obstacles. Controls Use your mouse to move the girl from side to side. You get three energy beads. When all three energy beads are used up, the game ends. Avoid the rocks and tree stumps! Flowers give you 100 points, stars give you 200 points. Going off a jump ramp gives you 500 points. The game is over when you reach the finish line! 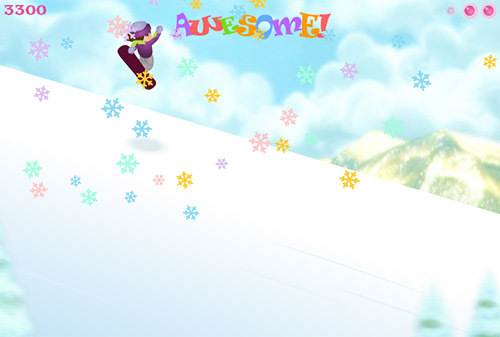 Really well made snowboarding game for girls. Nice and polished graphics.